The George Washington University is pleased to announce the launch of a new cross-disciplinary initiative in Digital Humanities. In honor of the launch, Dr. Michael Witmore, Director of the Folger Shakespeare Library, will offer an inaugural lecture on data-mining and literary analysis. We would like to inform everyone of the first official GW MEMSI event of the 2013-2014 academic year and the inaugural Digital Humanities lecture! This exciting event is co-sponsored by GW MEMSI, the Dean's Scholars in Shakespeare program, the Department of English, the Department of History, Gelman Library, and the new GW Digital Humanities Institute, which is co-founded and co-directed by Alexa Huang and Jonathan Hsy. 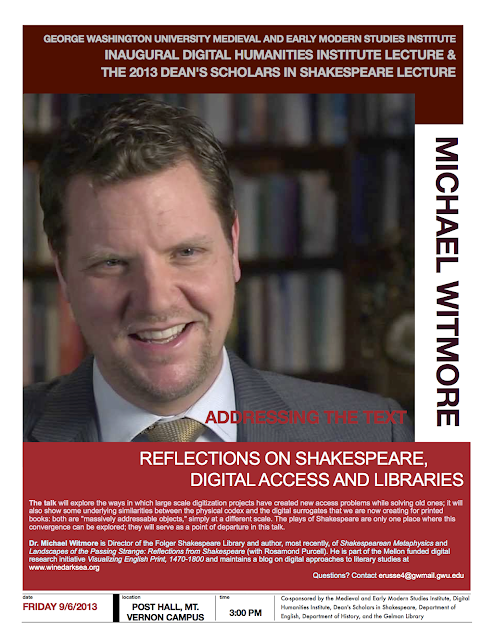 We are proud to welcome Dr. Michael Witmore, Director of the Folger Shakespeare Library; his work on data-mining and literary analysis will provide an entry point into a discussion of some of the possibilities -- and potential limitations -- of large scale digitization projects (flyer and complete info below). This event is free and open to the public. One significant factor building up to the establishment of the Digital Humanities Institute was the success of the interdisciplinary Digital Humanities Symposium held at GW in January of this year. The GW Digital Humanities Institute is a hub of research, teaching, and outreach activities around digital and new media. It is founded upon the core belief that the arts and humanities actively transform and are transformed by digital cultures. Time and Location: 3 pm on Friday September 6 in Post Hall on the Mount Vernon Campus. Followed by a reception. The talk will explore the ways in which large scale digitization projects have created new access problems while solving old ones; it will also show some underlying similarities between the physical codex and the digital surrogates that we are now creating for printed books: both are "massively addressable objects," simply at a different scale. The plays of Shakespeare are only one place where this convergence can be explored; they will serve as a point of departure in this talk. 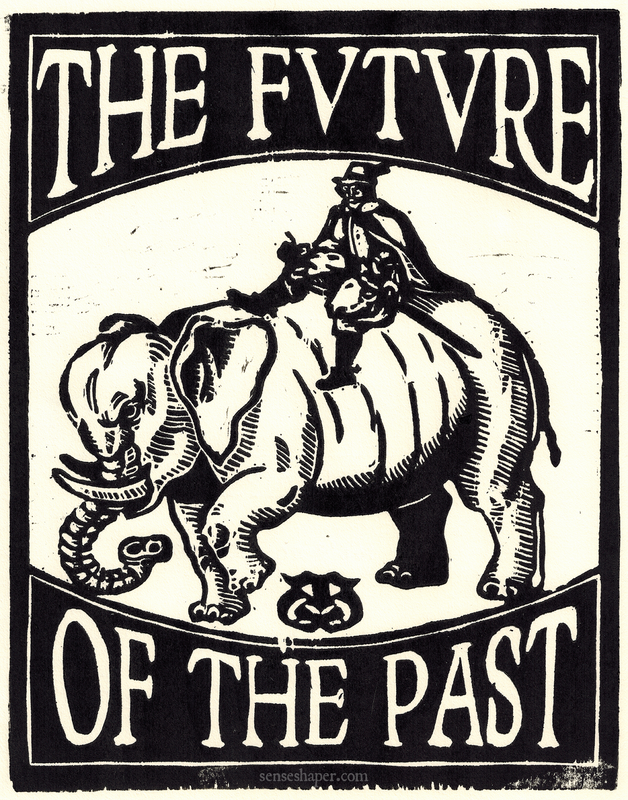 Dr. Michael Witmore is Director of the Folger Shakespeare Library and author, most recently, of Shakespearean Metaphysics and Landscapes of the Passing Strange: Reflections from Shakespeare (with Rosamond Purcell). 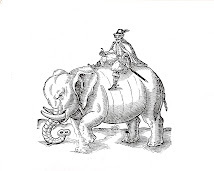 He is part of the Mellon funded digital research initiative Visualizing English Print, 1470-1800 and maintains a blog on digital approaches to literary studies at Wine Dark Sea. Free shuttle to Mount Vernon Campus: full information here.